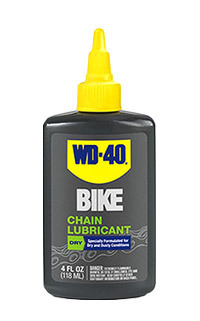 WD-40® BIKE Dry Lube isn’t just for chains. It’s great for brake pivots, derailleur pulley bolts, main parallelogram pivots and pedal retention springs. If you’ve just finished a wet ride, drop a spot of lube inside brake and derailleur cable housings to keep things moving freely. Remember to wipe off excess lube.